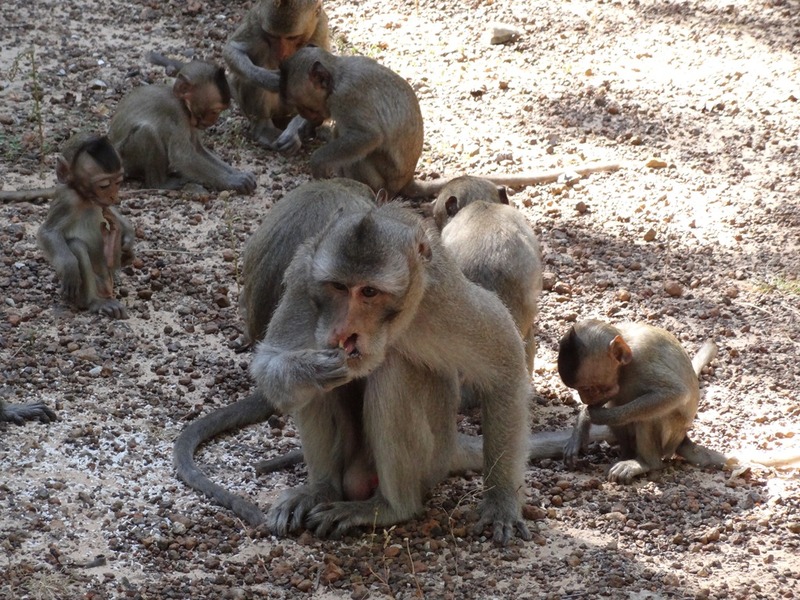 Tracking individual monkeys gives us a clearer idea of their habits and the extent of their range. 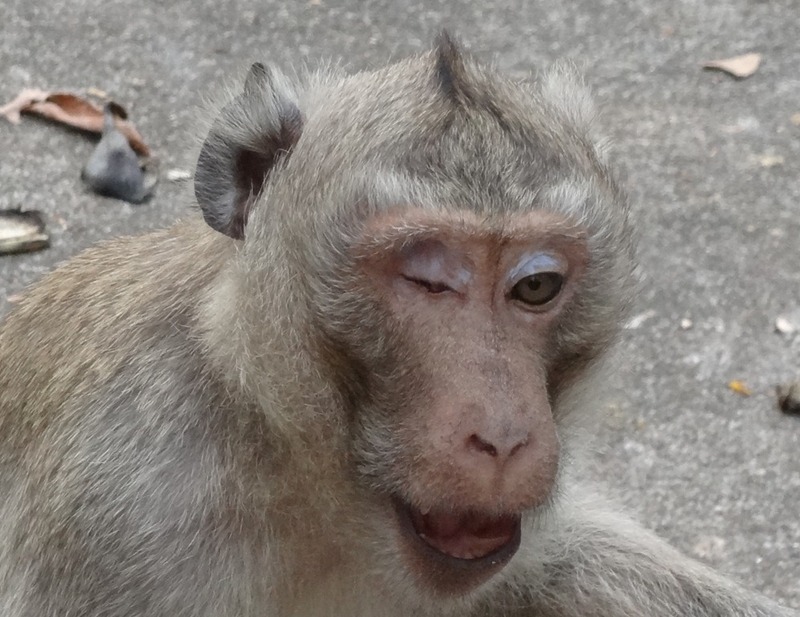 That’s the theory, but in fact it is very difficult to distinguish between one monkey and another. A few individuals do stand out but amongst 700 or so monkeys it can often be several weeks between sightings of any such individual. 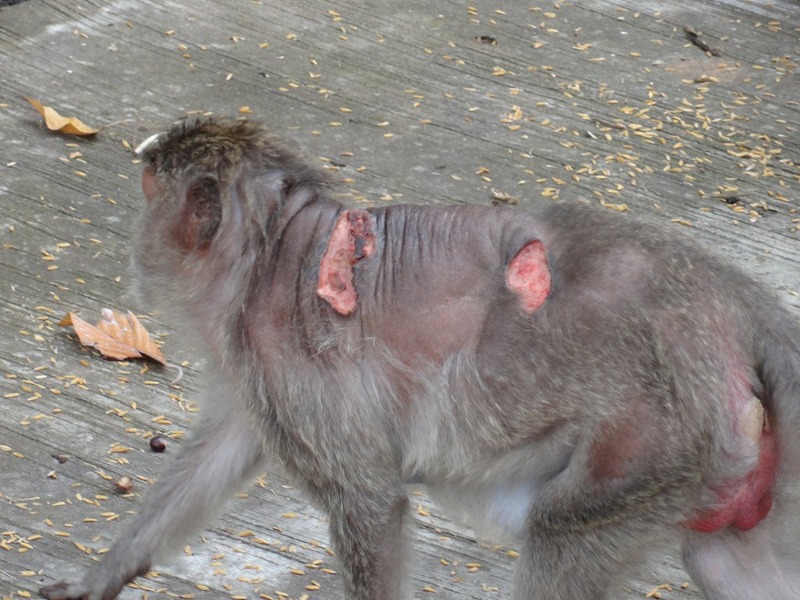 Easier to recognize are those monkeys which are carrying injuries, and unfortunately there are a number of these, so getting a sighting of at least one of them on any given day is fairly certain. 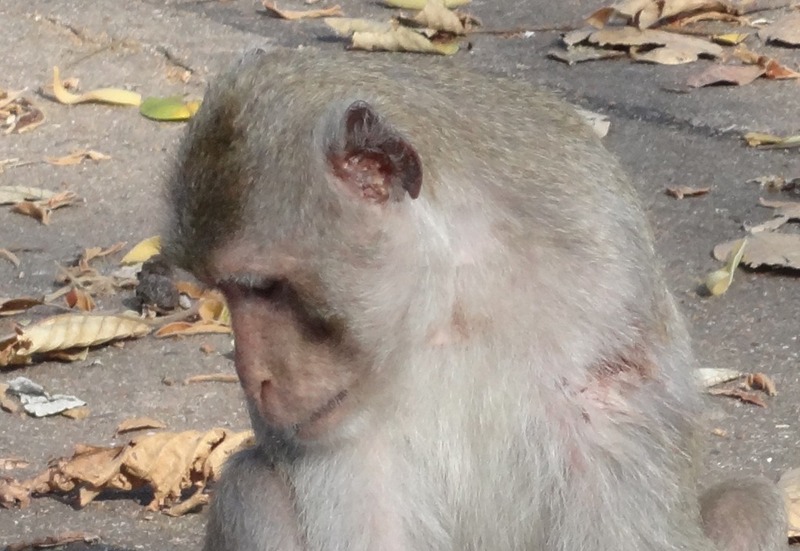 The easiest of our monkeys to spot is this one, which has no tail. He seems to live the usual social life, mating with several females and often found shepherding young males, presumably his offspring. He frequents two main areas: along the wall north of the main gate, and in the open area just inside the main gate during much of the day. 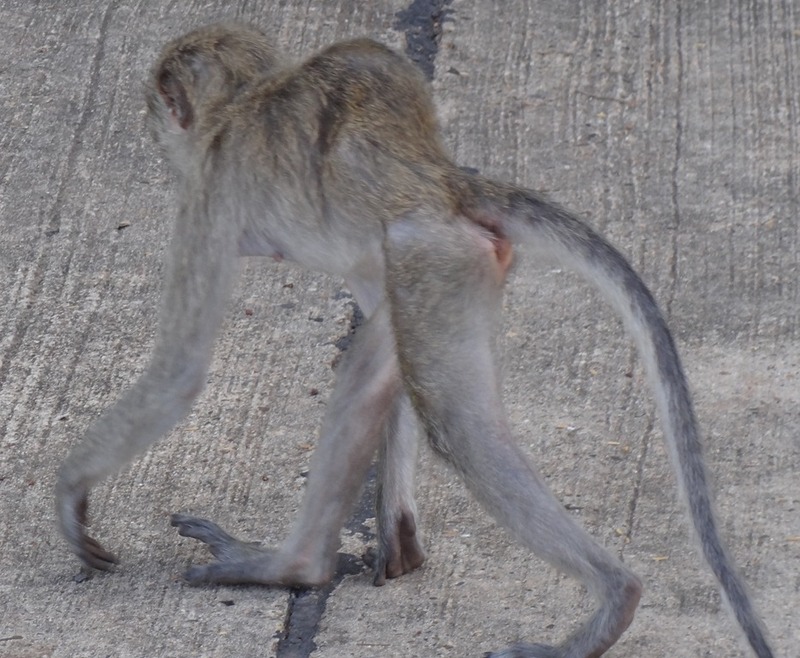 There is another male which has only half a tail and that seems fairly certainly the result of a traffic accident, but whether the same is true of this one I don’t know. 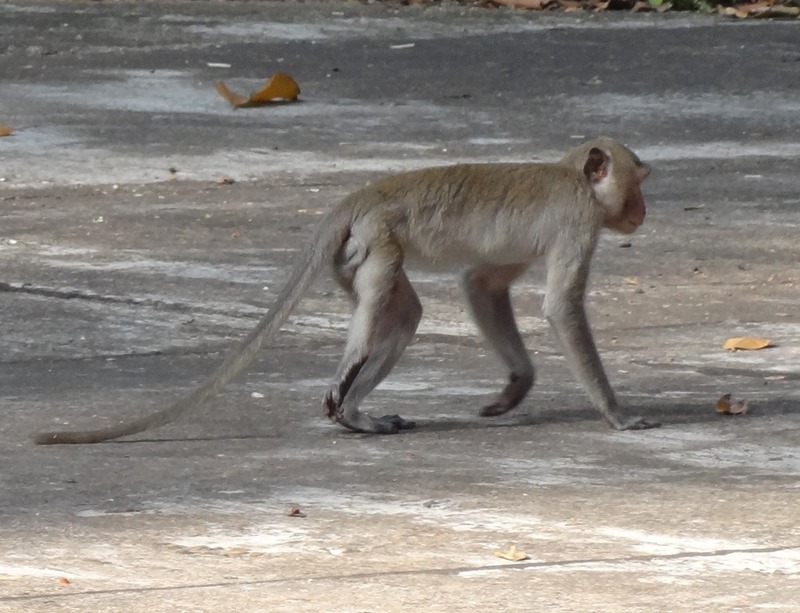 I don’t see the monkey with the half-lethngth tail very often and have no photo of him. Traffic accidents are almost certainly the cause of the most frequently-seen injury. 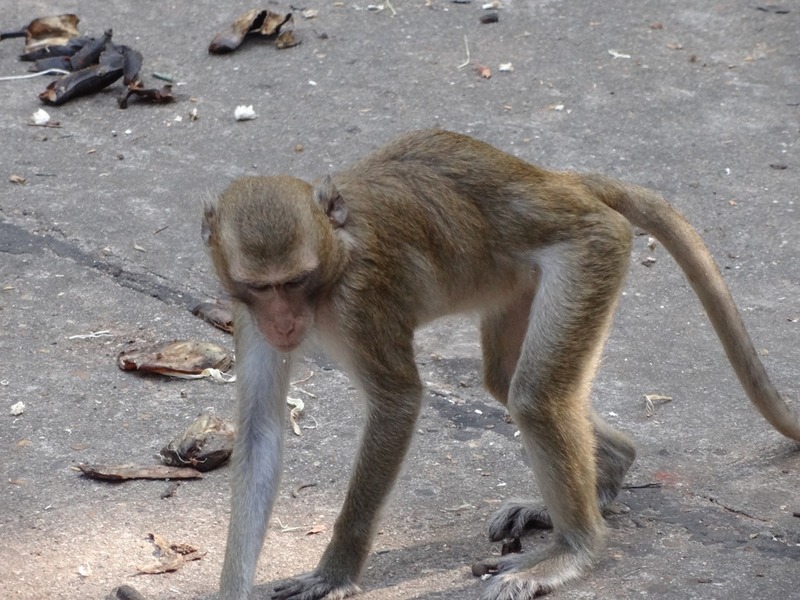 At present there are four or five monkeys moving along on the ground using just three legs. Most often it is just the foot which has been rendered unusable, presumably by a vehicle running over it. Injuries to the eye are also quite frequent and are most likely the result of fighting, although slingshots cannot be ruled out as a possible cause. This male is one I see most days, and one of the conclusions I draw from that is that his use of the forest is confined to one particular area. 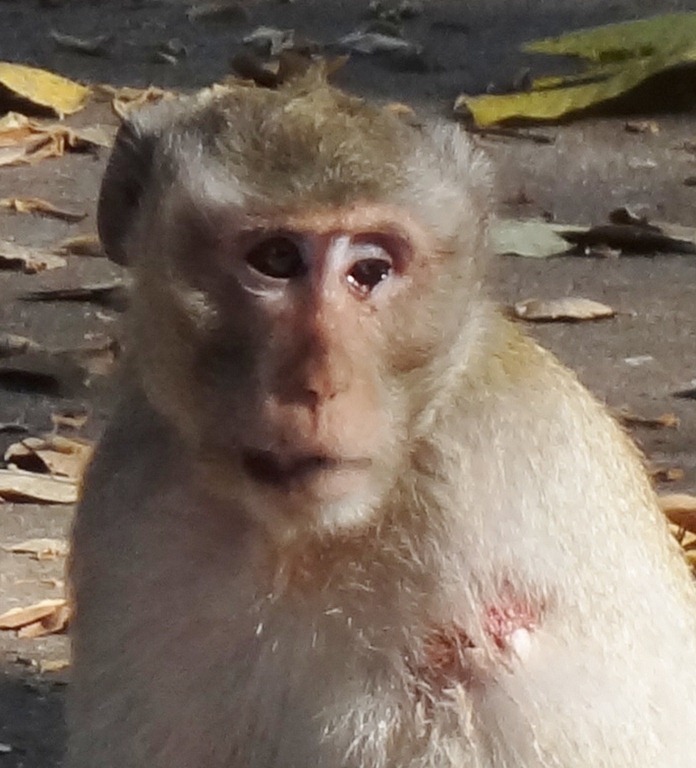 This next monkey has an injury to his right eye and some damage to his ear and shoulder – all of which indicates his recent involvement in a fight. 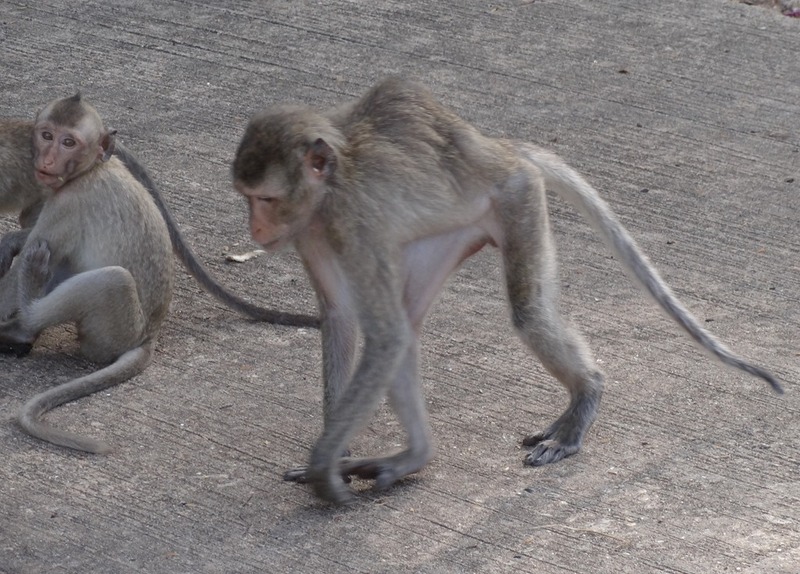 There are two or possibly three monkeys, all female, which have hump backs. The smaller of the two has the more severe case and it seems possible that her growth has been restricted by the disease causing such severe over-curvature of the spine. This is the second female. 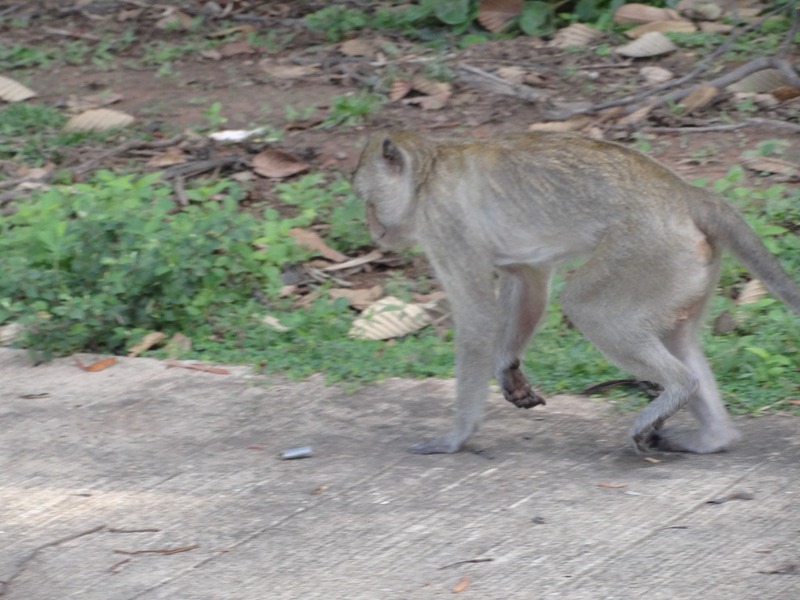 Her spine is affected further towards the tail and the deformity is much less pronounced. 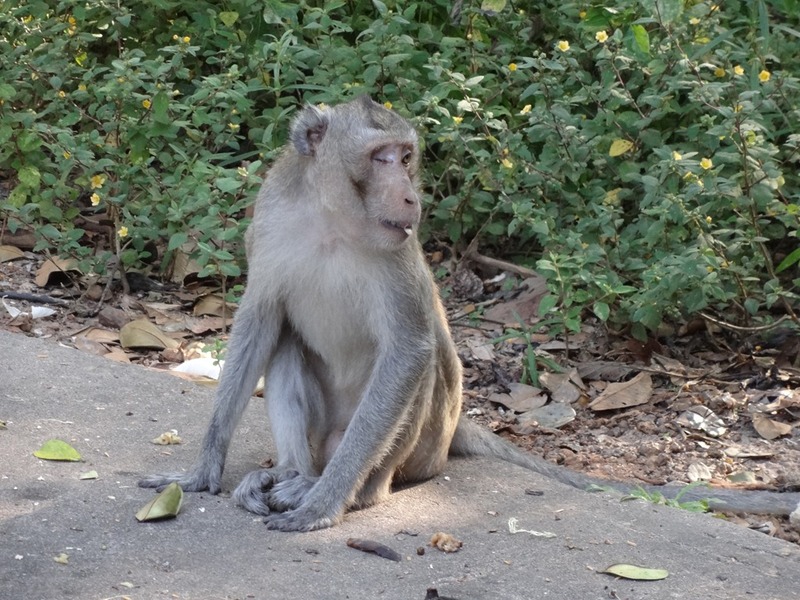 Both the two monkeys are sometimes found in the area just inside the main gate, although the smaller of the two is more often to be seen near the pond area further south. I have never seen the two of them together so their being of the same family can almost certainly be ruled out. 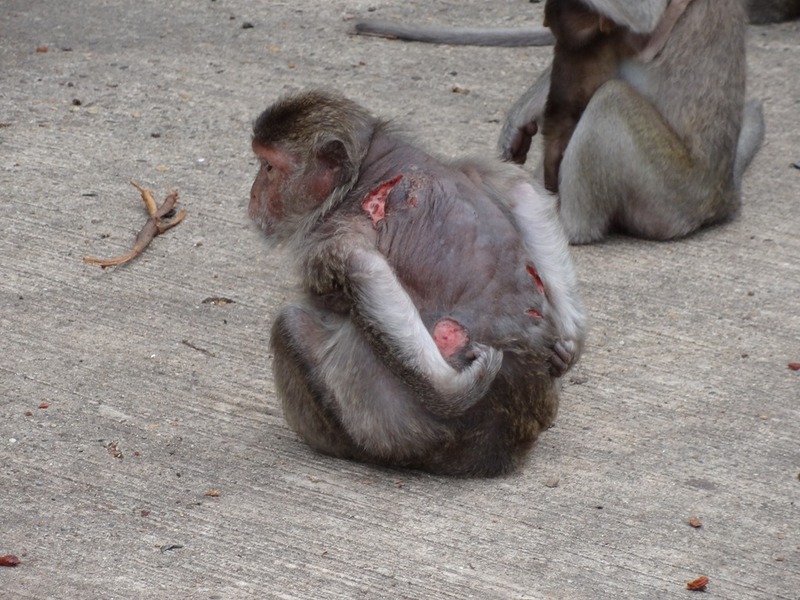 Most of the injuries I have seen our monkeys carrying do not seem to be life-threatening. 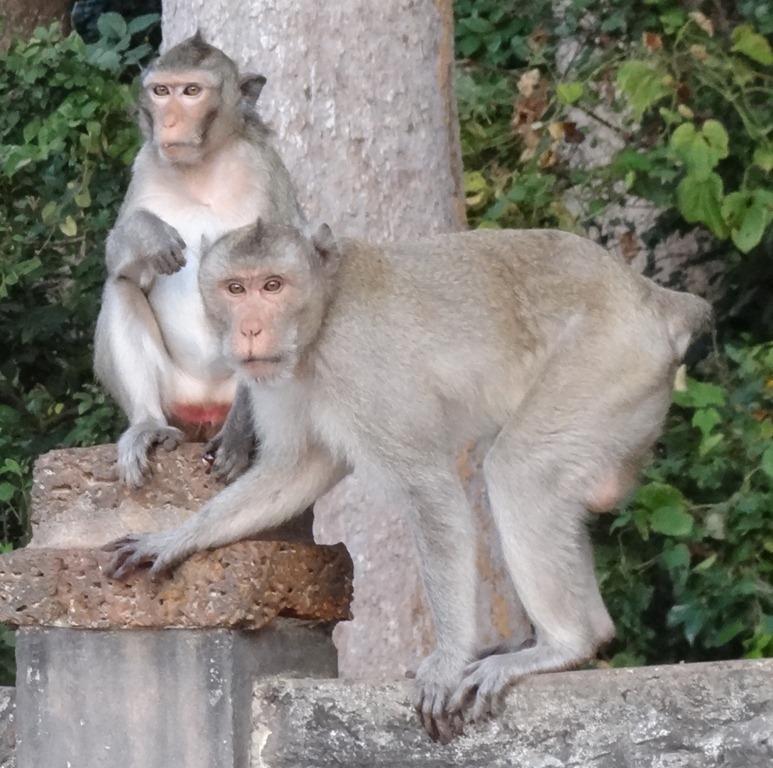 But two monkeys, at least, do not seem to have survived. The first was a large male that I saw just once, in November 2011. He was with a group of all-male juveniles and seemed to be their guardian, while they were eating the rice grain we provided, anyway. His injuries were severe and probably received in a fight, but he was eating and appeared to be generally in good health. Yet I never saw him again, though he would have been instantly recognisable. I can only think that perhaps he left the troop or that infection in his wounds caused his death. A female that I came across in June this year had a very severe case of what looks like sarcoptic mange. She had lost a lot of hair from her back and the exposed skin looked very leathery. She was constantly scratching herself and this may have caused the open wounds. 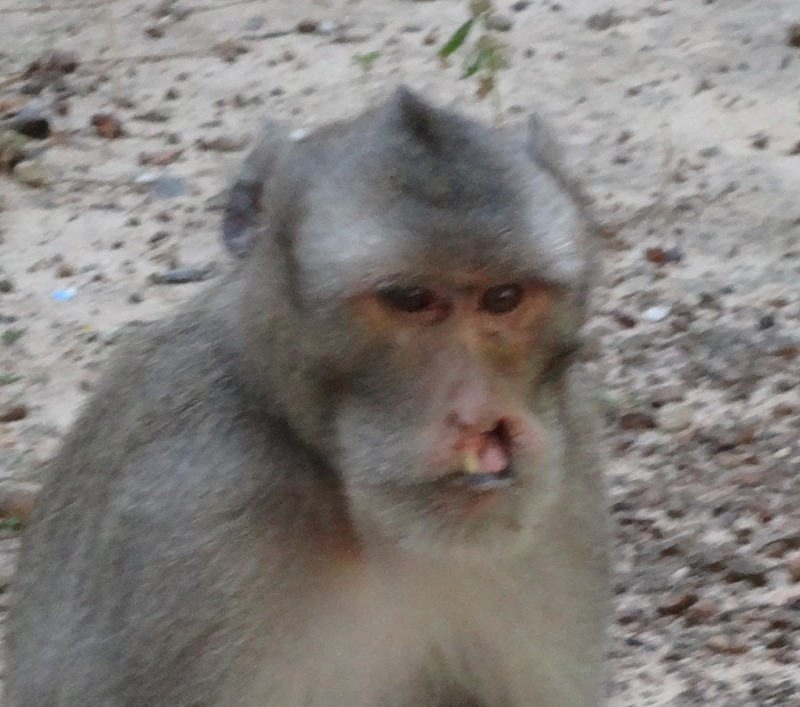 She was eating undisturbed by other monkeys but did not seem to be part of any group. She sat and ate and walked alone. I saw her several times over the course of a week or so, but have never seen her since. I can’t believe that she recovered though. 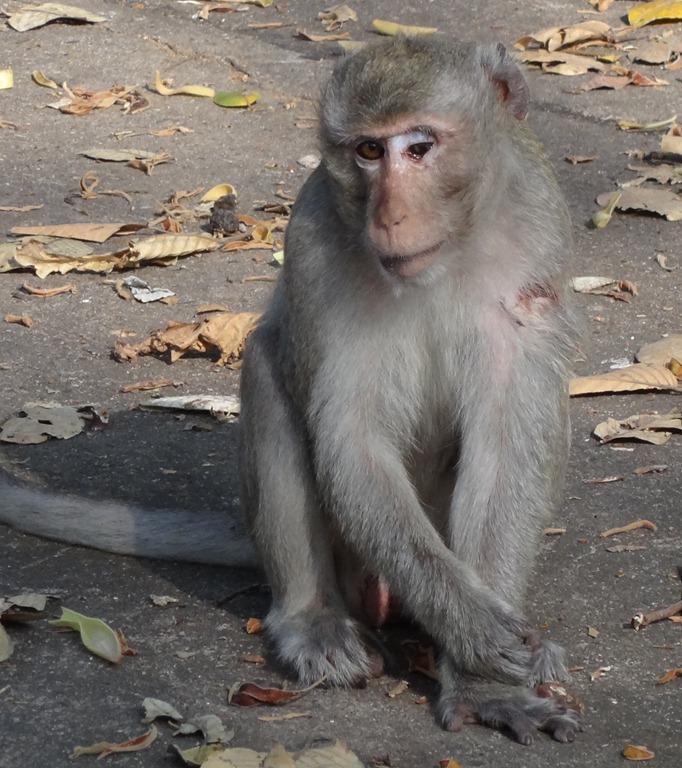 This entry was posted in Long-tailed Macaques, Macaca Fascicularis, Macaques, monkey forest, Monkeys and tagged Don Chao Poo Forest Phana, Long-tailed Macaques, Macaca Fascicularis, Thai monkeys. Bookmark the permalink.